Yellowstone National Park is a wonderful place to visit and photograph with its geyers, canyons, waterfalls and, of course, the wildlife. 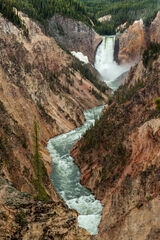 The Grand Canyon of the Yellowstone is just amazing with the view down the canyon over the Yellowstone River. If its color you want, Grand Prismatic Spring has it. Keep an eye out for those bison!